Tall vines produce plenty of 5-inch, tender, flat pods that are tasty when eaten fresh, steamed, cooked into stir-fries and frozen. When we grew this pea in our test garden, the staff loved the pea's size and flavor. The peas held up well on the vine, allowing for an extended harvest. Green Beauty Snow Pea's attractive purple flowers were an added bonus! Vines grow 6-8 ft. tall and require a support, such as a fence or trellis. 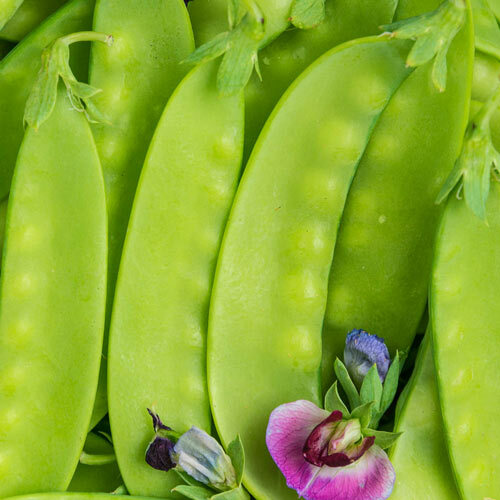 Snow peas perform best when planted and grown under cool weather conditions and in well-drained soil. Plant seeds in the spring when the ground can be worked and before the last frost date. Untreated seed. 60 DAYS. Height26 - 32 inches, 6 - 8 feet in ideal conditions. Soil RequirementsFertile, sandy, rich, well-drained soil. CommentsGreen Beauty is true to its name, growing vigorously to heights of 6-8' tall in ideal conditions! Plants require support (item #12826 Pea Fence). Attractive purple flowers are followed by seriously huge, tender pods that hold well on the plant allowing for a longer harvest window without losing flavor. Peas hold well on pod allowing for longer harvest window. Attractive flowers lead to huge, tender pods. Pods are large, tender, and tasty. Hold flavor on the vine longer than most. Yield20 lbs. per 100 foot row.